This article was published first on Tech in Asia. When talking about technological innovation and the way it tends to rewrite the rules of particular industries, the area of fast-moving consumer goods (FMCGs) – things like drinks and processed foods – is not generally one of the first ones we think about. But as with many tech wonders that have entered our everyday lives, the things that make the most impact are often the ones we didn’t know we wanted – or, in this case, what FMCG companies wanted. One Singaporean company is bringing this kind of change to some of the world’s largest distributors and retailers of such items. 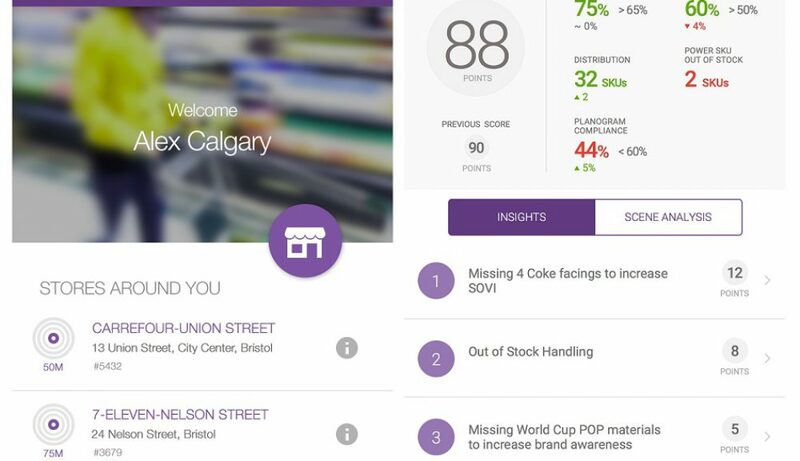 Trax has developed computer vision tech that, among other things, allows FMCG suppliers to keep track of their products on retailer shelves. The problem, Trax CEO Joel Bar-El tells Tech in Asia, is that companies like Coca-Cola and Procter & Gamble expend a lot of resources to ensure shelf space and specific arrangements of their products at retail locations. Within the industry, the arrangement and positioning of products in a store is called a planogram, and it helps achieve maximum visibility and increased sales for what a company is peddling. Before this, companies were only able to keep tabs on their in-store products with manual surveying. This meant that a person with pen and paper was visiting stores and standing in front of shelves to check that everything was as expected. “The information [gathering] was inaccurate, lengthy, and costly,” Joel says. This particular use case for Trax is called planogram compliance. It is achieved through fine-grain recognition, a branch of image recognition that can help computers tell two very similarly shaped products apart (for example, a can of beer from a can of soda). “While other services can classify products into the same family, this is really to distinguish different members of that family from one another – even if they are very similar or identical [to each other],” Joel says. He adds that the tech can even tell scale, which other computer vision algorithms can’t. Trax does that with a mobile app, which means even a garden-variety smartphone camera can be used to do the trick. The user simply snaps a picture of the shelf and uploads it through it. A few moments later, the online system has analyzed the image, returned with a digital version of the shelf, and produced a report on what it contains. “Every large company has between 50,000 and 150,000 sales reps that go into stores day in and day out to ensure specific standards are being met,” Joel says. Examples include filtering specific products on shelves, like gluten-free and low-fat ones, or leaving user reviews on particular wares or brands. Other commercial uses include “smart coolers,” or coolers equipped with cameras that collect images of the contents to make sure that, say, a Coca-Cola-branded cooler is not just full of Pepsis instead. The company can also analyze images taken by third-party equipment to provide insights about product visibility within stores. “We have created an infrastructure for collecting a lot of images worldwide from many sources, essentially providing information from any market on any category,” Joel says. All this data can be analyzed to provide analytics and insights to the company’s clients. “We’re using deep learning and neural network infrastructure and the more data points we can pull in, the more sophisticated the results can be,” Joel explains. Trax has managed to sign up big-name international clients that use its services, from the aforementioned Coca-Cola and P&G to companies like Henkel, Lavazza, and more. Trax came about after Joel had co-founded Cam-Trax, an Israel-based company that creates computer vision and image recognition tech to be used in applications similar to those in Microsoft’s Kinect motion control system. The Trax co-founding team comes from a variety of industry backgrounds, but most of them have extensive experience in the FMCG space. For example, Joel’s predecessor and Trax’s first CEO, Tamara Minick-Scokalo, is an experienced executive whose CV includes leadership stints at the likes of Cadbury and Kraft. Dror Feldheim, Trax’s chief commercial officer, has worked in that sector for the past 15 years in various markets, including Russia and Eastern Europe. The five-year-old company has been mostly self-funded so far, with the exception of some funding from private investors. It’s currently in the process of finalizing another round of investment. Its product is available in over 40 markets worldwide and while it has been seeing strong growth in Asia, Europe, and South America, it’s now focusing on North America as well, with the appointment of Steve Hornyak as CEO for North and South America. That said, there are other startups in the region who work with image recognition technology. Singapore-based Visenze partnered with Indian eCommerce Flipkart to enable image-based search last year, while Taiwan’s Viscovery also uses image recognition on visual search. With retail clients and partners worldwide, as well as the ability to use the cameras we all have in our hands every day, the potential reach for Trax’s products is huge. “We’re in a very good place to make a big difference, using this technology to identify products in the retail environment,” Joel says.